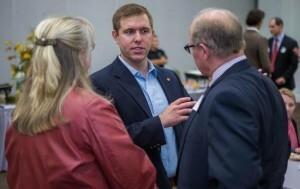 A Marine veteran who is just 33 is attempting to convince national conservative organizations to help him in his campaign in hopes that Alabama’s Republican Senate primary is to be the next big battleground between the Republican establishment and conservative outsiders. The candidate is Jonathan McConnell and he is running against Senator Richard Shelby, who is a longtime lawmaker with a campaign treasure chest of $19 million that has scared off many challengers in years past. Arguing that the time has come for Shelby to retire, McConnell, 50 years younger than the senator, scored a big endorsement last week from a political action committee Citizens Untied, a conservative group. During an interview last week, the Marine veteran said he was hoping to get endorsements from other conservative organizations that recently have endorsed challengers in the Republican Senate primary, calling this race he is in winnable. There are outside groups, such as Freedom Works, the Senate Conservatives Fund and Club for Growth, that have in the past spent large sums of money and do a good job of grassroots organizing for those candidates they come out and support, add McConnell. McConnell said the groups know that Shelby can be beat and know that the race is not just about money but about people who will have a choice in the race. While he was in law school, McConnell set up Meridian a private security business after the 2009 hijacking of the Maersk Alabama by pirates from Somali. The company now works defending merchant ships of the Somalia coast. McConnell said that in the senate race against Sen. Shelby he needed the support of owners of small businesses that have been in the capitalism trenches. Shelby for quite some time has directed federal dollars back into projects in Alabama, but some of that years of spending, has been questioned by McConnell. He called the state’s infrastructure one that was crumbling with over 6,000 bridges that need to be repaired or fixed, yet spending was being made on buildings that have the name Richard Shelby on them.